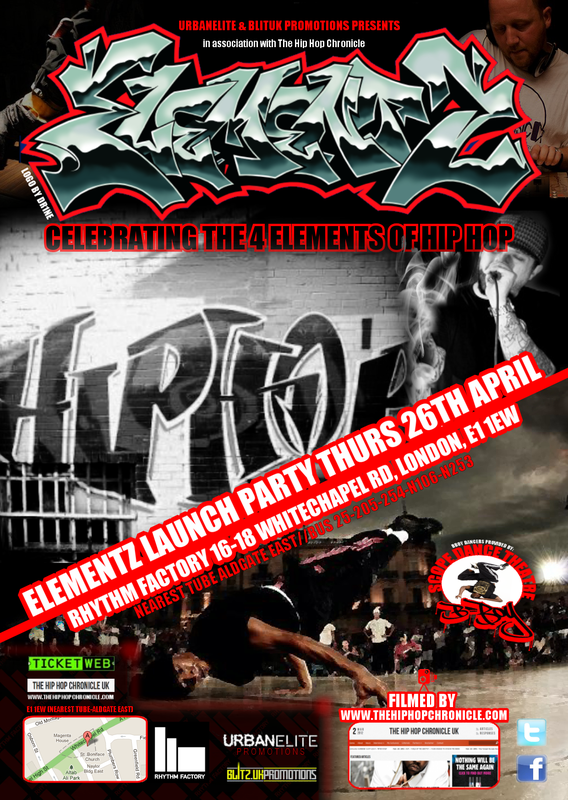 ELEMENTZ is a new club night celebrating the traditional elements of hip hop – deejaying & turntablism, MCs, graffiti, b-boys & b-girls, open mic, beatboxing – all knowledge under one roof. Planned as a quarterly event taking place throughout the year, the launch night takes place at Rhythm Factory, London on Thursday 26th April 2012. Each event will host some of the biggest established names on the scene, while also showcasing new emerging talent and representing hip hop culture in all its forms. Since the early days of the block parties in New York’s Bronx, hip hop has become a global phenomenon. A culture which has developed over the years representing all people irrespective of ethnic background, nationality, gender or religion. While Hip Hop Music has gone on to become a multi billion selling industry over the years, and has fragmented into various genres, the real spirit of hip hop culture remains within the various elements, practiced by those with an understanding of its principles. Resident DJ is London’s “1st Lady of Hip Hop” Sarah Love, recognized from her days performing at the city’s renowned Kung Fu events through to her time presenting for MTV Base, BBC 1Xtra and being the only female dj to be nominated twice as “Best DJ” for a MOBO award. The events are in association with leading online media outlet The Hip Hop Chronicle. While covering the major stories from the UK and overseas, HHC have provided exclusive footage broadcast on BET, MTV and many others. HHC will film performances and interviews to be broadcast online in the weeks following each event. We are joined on the 26th April by some real legends in the UK scene. DJ 279 is one of the most respected hip hop dj’s in the game. Known for his long running “Friday Night Flavas” show on Choice FM, he is still representing the illest international sounds on his new Saturday night show. DJ Mr Thing, original Scratch Pervert, in 1999 won the World DMC DJ Team Championships in New York & was an individual finalist in the UK Championships in 2000. Also a respected producer, particularly well known for his work with Yungun. London’s DJ Snips has deejayed for Mos Def, Kanye West, Ghostface, Pete Rock, been a regular in London’s extensive club scene as well as the dj of choice for several industry parties including Talib Kweli, Pharaoh Monch, Dead Prez, all before holding down a residency in 2009 in New York. Still running the Livin Proof nights in London. Caxton Press have been busy in 2012 releasing a series of videos taken from their new album Shame The Devil. The group includes DJ Snuff, well known for his End of the Weak and Speakers Corner nights he created with fellow group member Manage, and the North West Rider himself, Kingpin. Together with eMCee Killa and Amy True, the group will be performing some choice cuts from the new album which will go down well with fans of true school hip hop & soul. Genesis Elijah has been one of the most consistent artists in the past year, first via his collaboration with Krate Krusaders on “Before I Was Famous” and then via a huge number of video releases over the past year, culminating in his “I Aint Even Charging Bruv” and “Painkillers & Pilkington” EPs out now and receiving Radio 1 support. The night is hosted by Mystro. A firm favourite of UK heads, his annual UK Rap Up on BBC 1Xtra has become a new Xmas tradition. He has just launched his new “What Kind of Drug is Mystrogen” EP currently enjoying heavy support on the airwaves, coming ahead of his new album due out later in the year. 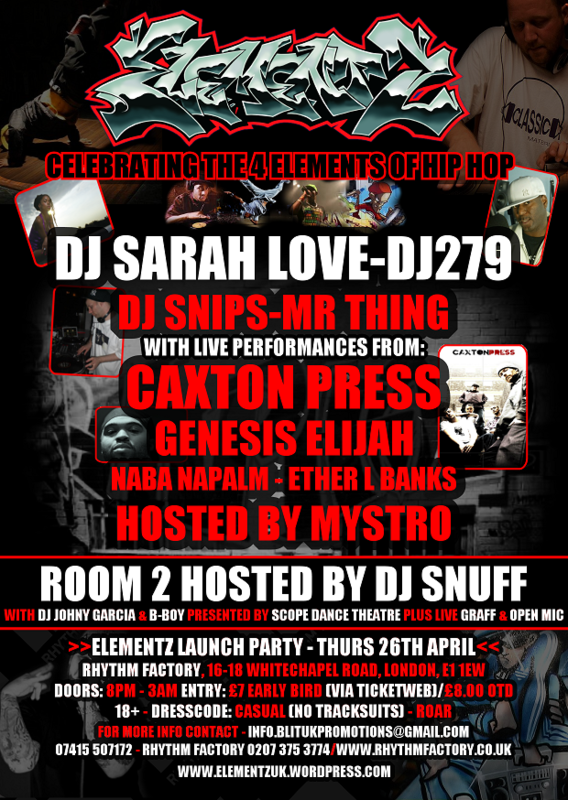 Also look out for performances from “Ones To Watch” Naba Napalm and Ether L Banks. Check examples of these artists’ videos, tracks & work in the various pages on this site. More will be added in the coming weeks. 8pm – 3am. This is an over 18′s event only. Dress code is casual though no tracksuits. The venue reserves the right to refuse admission.